I have been somewhat absent over the past week. My family has had quite the adventure. 2018 was promised to be a season of new beginnings and doors opening for me as well as my family. I approached it with open arms, and honestly a little disbelief. How do you do that, right? What do you mean, “open arms but disbelief?” Quite the contradiction; but very true for me. I walked out of 2017 heart broken and overwhelmed from losing my Daddy. That was the most devastating thing that I have ever have happen to me in my life. I cry daily, I think of him all the time. I know that these feelings and days will not be so difficult to endure but in order to understand a person, you have to know where they are coming from. In order to understand and respect where a person is going, you must know where they are coming from. As December closed, I was given a word for my life. A word that simply said, I am right on the other side of this giant door that God is ready and waiting to open. Discernment was prayed over me, favor and peace. My mind heavy with these emotions and the excitement of new things to come, I opened my arms to 2018 but I was definitely skeptical as to what was next. Don’t forget ya’ll, I’m human. (wink, wink). At the beginning of the year, I heard a quote on the Today Show discussing health and diet. You know all the new year resolution stuff that happens every year? The doctor on the show said, “ A sedentary life stiffens the heart.” Boy, did I not realize how that statement would ring true to me. 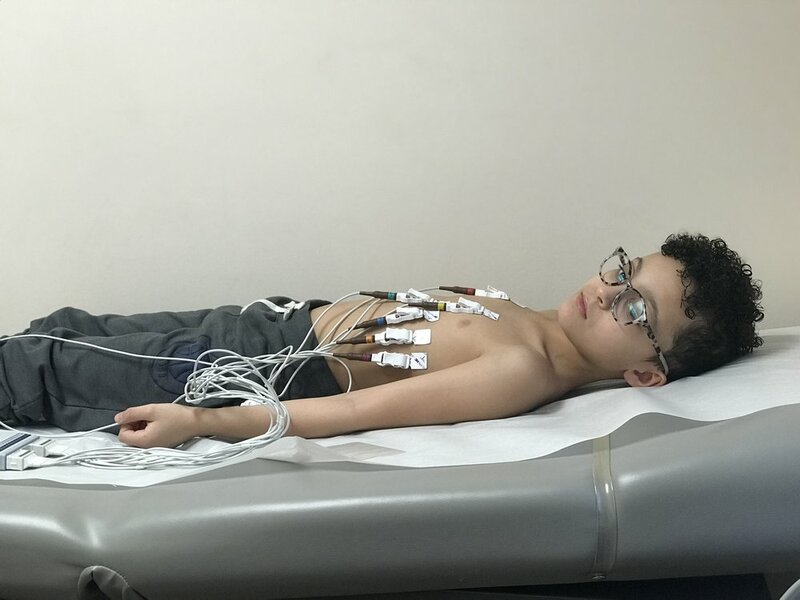 Here, in the middle of my working on the next big project that I feel will impact women all over the country and world, I learn that my son has an issue with his heart. I felt that I was being active in my walk, my life, and then boom, this happens! Jamison is so very special to me. He is my first baby. He is so very special to our family. Last week he let us know his throat was bothering him, which is a regular occurrence for our boy at least once a year. Then he nonchalantly mentioned that he was having feelings of his heart “stopping” and once it started back, it would startle him in a painful way. Say WHAT?!? We were terrified. What began as a trip to the pediatrician for what we thought was strep ended with us being sent to the hospital to have an EKG. Can you say, fall apart?? Umm, yeah, that is exactly what I wanted to do, but how can you with two little people staring in your face leaning on you to be strong? Jesus be a leaning post, right now. Fast forward two days, a weekend and another day and a half and we had results. Our firstborn, the baby boy who I prayed for, the baby who is the first person to hear my heartbeat from the inside had an abnormal EKG, our son had what they considered a Right Bundle Branch Block and we were given an expedited appointment with the pediatric cardiologist. This is usually a condition that is consistent with a person who has structural damage, an enlarged right side or a hole in their heart. Your mind tells you to stay strong, your heart sends a tear to your eyes. It sends a tear to the same eyes that are looking at this boy who was chosen to do great things and all you can do is show him strength; so many emotions. As my husband hears me on the phone and watches me write down the instructions that were given, we speak without speaking and our feelings are mutual. Throughout the rest of the day, not much was said or done, but what happened at the end of the night seriously changed our lives. See, I have been praying about my family and for my husband and some things that we needed in our lives and God who is always faithful, proved himself worthy again. Before we went to bed Monday night, my husband gathered us all together in our den, anointing oil in his hand and he began to pray and cry out to God on behalf of our son. He began to remind God of who He is and what He said He would do. He began to cry out to God in sacrifice for our son. I begin to worship in my heart because God was answering my prayer for my family and my husband. Surprisingly, the matter of my son’s heart wasn’t the need. The matter was our family. God was restoring, yet again another part of OUR hearts. God is so faithful. In that moment, we received healing and we hadn’t even been to our son’s appointment yet. God is awesome. Now, it is Thursday. We take our little boy in for a second EKG and an Echo to see exactly what was going on with his heart. The doctor explained to us that our son’s EKG was consistent and he did in fact, have the block and whatever we saw next, would determine what we would do. I wasn’t sure how to feel, neither was our boy; but he was strong. He always is. He is probably one of the strongest, most resilient people I know. I love him. Well, we got to see the boy’s heart. It was absolutely amazing. The doctor explained the pictures we saw and the way the blue and red indicated the direction of the blood flow. He explained how the equipment used the doppler just as meteorologists did. He showed us the true meaning, (these were his words) behind the phrase, 'a way to a man’s heart is through his stomach.' You guessed it! We were able to see the boy’s heart through his stomach! We even saw his heart from his aorta…I was in awe with what we saw and heard. The next words we heard were like eating a piping hot yeast roll with honey butter. (yum) The doctor told us, “Jamison has a perfect heart.” There were no holes, no enlarged places, nothing. His heart wasn’t typical, but it was perfect. We were afraid and relieved all at the same time. Isn’t that how we are as believers? We are sometimes afraid but because God is within us and because he loves us, we are made perfect. We are not of this world. We aren’t typical but we are made perfect by God’s grace. 2 Cor. 12:9. I am so thankful for that, aren't you glad?? The Right Bundle Branch Block was still there and the doctor recommended that the boy wear a BodyGuardian heart monitor for 28 days and if there are any other issues, call as quickly and as often as we needed. We also have to have annual EKG testing. When we asked why this hadn’t been detected or where it could have come from, there was really no answer. This was the first time he had complained, therefore there was a need for an EKG. We left with joy in our hearts and we were thankful that our prayers and the prayers of our friends were answered. The incredible thing about this is that God not only showed us that all we have to do is believe He is who He says He is, (a healer) but He also restores that which is broken; over and over and over….God hears us. God knows us. God cares about us, and He answers prayers. It is all a matter of the heart. It’s all about moving and being active with our faith; not being sedentary. It’s when we are sedentary, our heart becomes stiffened and weak. We can’t see God for who He is. When we activate our faith, move according to God’s word and align our lives, we see Him all around us. The eyes of our hearts are opened. All we have to do is activate what we have been given, and that is His promise. Who Do I Have to Be?